The queen of Sheba loved her pistachios so much that she demanded the entire kingdom’s harvest be set aside for her. What a nut. Origin USA. Pistachio nuts are actually kernels obtained from the fruits belonging to the Anacardiaceae family. The plant is a medium sized broad, bushy, deciduous tree, believed to have originated in the mountain ranges of West-Asia and Turkey. Pistachios grow well in a hot, dry summer and cool winters. After plantation, it takes approximately eight to ten years until the plant produces its first major crop. Once established, it keeps bearing fruits for many years to come. Each season, the tree bears heavy clusters of fruits which appear similar to a bunch of grapes. Its exterior has an off-white color shell which splits apart exposing light green kernel inside. Pistachios are rich source of energy. They have good amounts of mono-unsaturated fatty acids like oleic acid and antioxidants. 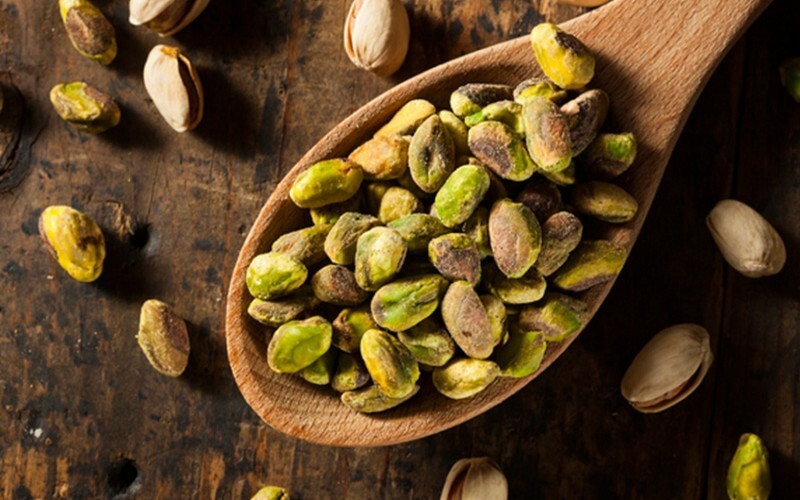 Regular consumption of pistachios in the diet may help lower bad LDL cholesterol and increase good HDL cholesterol levels within the blood which can help reduce the risk of heart disease and strokes. They are rich source of many antioxidants such as carotenes, vitamin E, and polyphenolic antioxidant compounds. Research studies suggest that these compounds may help remove toxic free-radicals from the body and help keep us stay young and healthy. They are rich in Vitamin E, B Vitamins such as riboflavin, niacin, thiamin, pantothenic acid, vitamin B-6, and folates which are essential to everyone but especially if you’re pregnant. Pistachios are also high in minerals like copper, manganese, potassium, calcium, iron, magnesium, zinc, and selenium. 100 g provide 144% of the daily recommended levels of copper. Copper is an essential trace mineral that is required in metabolism, as well as red blood cell production. So how do we use them? Many people snack on the delicious raw nut alone, by splitting them open between fingers or using a nutcracker machine. They can also be enjoyed roasted, salted, or sweetened. Pistachios are nutty, yet pleasantly sweet in taste with a fruity aroma. Baklava, a sweet-pastry made of layers of paper-thin filo pastry filled with chopped pistachio and sweetened with syrup or honey, is a popular pastry dish in Turkey, Iran, Armenia, and the Middle East. They can be sprinkled over salads, desserts, and made into ice cream or used in based desserts like kulfi in Indian cuisine, or in biscuits, sweets and cakes. Pistachios are also a great addition to vegetable or fruit salads. And of course they work so well in raw food! Simply blending the nuts in a nut chopper until fine creates the most beautiful bright green nut dust. You can sprinkle, dust, and roll anything in it to give you an incredible vibrant powder to decorate raw cakes, ice cream or energy balls. Beautiful, delicious and good for you. 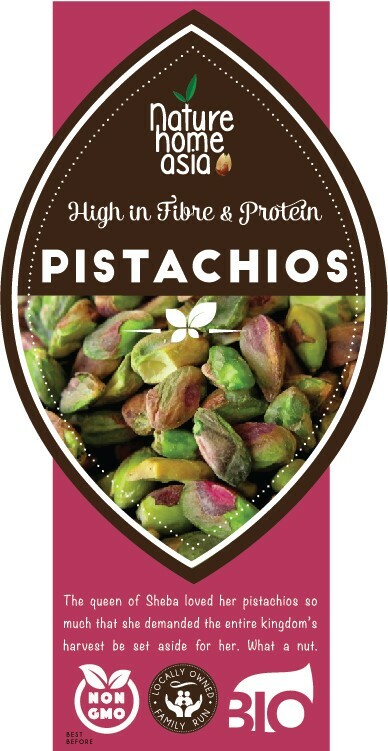 Give Pistachios a go!